The foil was perfect as always! Also I love that you guys ask what date the customer needs their items by! Awesome! The quality was good and the delivery was quick but the color for the "dark blue" wrappers would be better described as "royal blue." 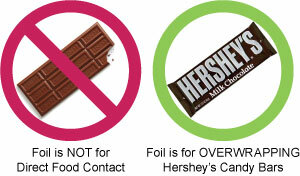 This foil was perfect for the candy bar keepsakes I made for my daughter's baby shower. Candy Wrapper Store is awesome! I have used the Candy Wrapper store twice and I have had a good experience each time. I have recommended it to friends. The delivery is always very fast and neatly packed and good quality items.